As we launch new digital services at the Ministry of Justice, we are actively seeking feedback from users. Three weeks ago, we added a feedback form to our court finder service, which is currently a 'beta' (a fully working prototype which we're testing with users). At the top of every page on the site, you can see a message with a link to the form, asking for your comments to improve the service. 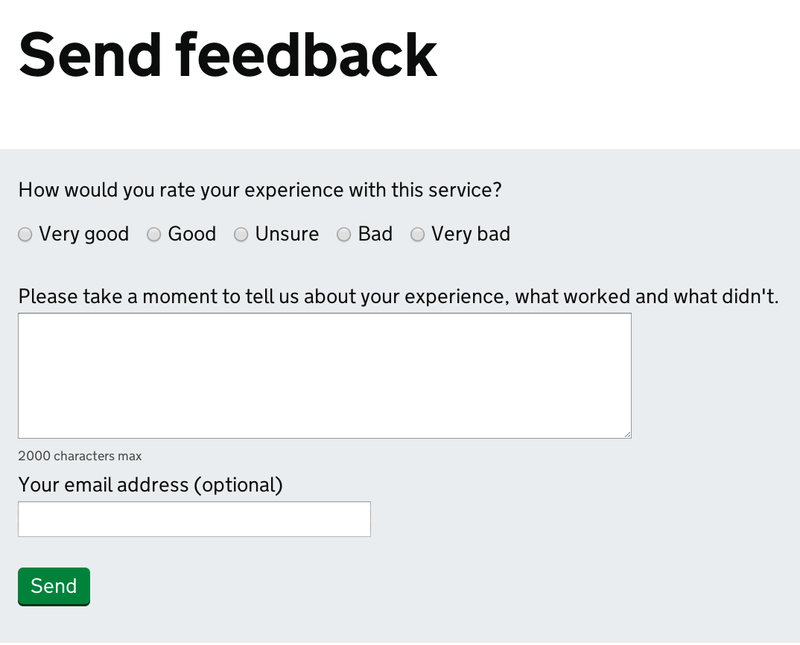 The form is simple and asks you to rate the service on a five-point scale ranging from 'Very good' to 'Very bad' and provide any comments on your experience (what worked and what didn't). You also have the option of giving your email address, which gives us the chance to contact you if we need more information on fixing a problem. The rating helps us measure the quality of the service. We are also tracking it to see how it changes over time. As soon as the feedback form went live, we started receiving a flurry of feedback, both positive and negative. Over the last three weeks, we have received comments from hundreds of users, which has informed and helped us tremendously to further improve the service. For example, we fixed a bug in the map displayed for a court based on a user's comment. We also added court numbers to the search results page, which was requested by a number of users. Seeing the popularity of the feedback form on court finder, we quickly rolled it out for the immigration and asylum appeal decisions service as well. This service receives much less traffic, so the volume of feedback has been lower, but still very valuable. If you use either of these services, please let us have your feedback. We read every single comment and roll out improvements as quickly as we can. We'll also be adding this feedback form to other services that we're building and would love to know what you think. First, let me be the first to provide feedback on your feedback form. I like it! It looks simple & easy to use & feedback usually leads to a better platform for all; so bravo! Second, there are two minor inaccuracies in a listing on your website which I would be most grateful if you would correct please. Please contact me with an email address so I can send you the details. Thanks very much for your comment - we're glad you like the form! You can obviously use the form to point out any errors, or email us at courtfinderfeedback@digital.justice.gov.uk.